↑ Zeitoun, Elizabeth; Yu, Ching-Hua (1 July 2005). 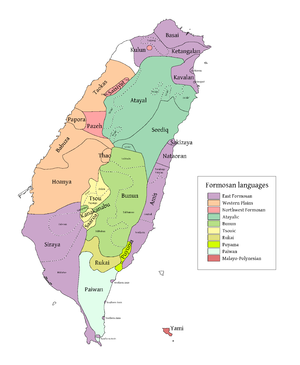 "The Formosan Language Archive: Linguistic Analysis and Language Processing". International Journal of Computational Linguistics and Chinese Language Processing. 10 (2): 167–200. ↑ Li, Paul Jen-kuei; Tsuchida, Shigeru (2006). Kavalan Dictionary (अंग्रेज़ी and चीनी में). Taipei: Institute of Linguistics, Academia Sinica. आई॰ऍस॰बी॰ऍन॰ 9789860069938. ↑ Diamond, Jared M. (17 February 2000). "Taiwan's gift to the world". Nature. 403 (6771): 709–710. doi:10.1038/35001685. ↑ Fox, James (19–20 August 2004). Current Developments in Comparative Austronesian Studies. Symposium Austronesia, Pascasarjana Linguististik dan Kajian Budaya Universitas Udayana. ANU Research Publications. Bali. OCLC 677432806.